She closed her eyes and took in a deep breath. Rivers of regret overflowed my carefully-tended banks. I set the teapot down, turned it so the spout aligned perfectly with the handles of the sugar bowl. “You knew I would not stay,” I said. The words tasted of bergamot and betony. They scalded my tongue. “Should I forsake the mists for you? The silver of the snowdrops under the moon? Forgive me, beloved, but it is not in my nature.” Better she should hate me, I thought. Better the bitter tea. I thought of her golden curls and long white limbs under the sun, the moon, the stars, and wondered how flowers could possibly compare. They care too much, these mortals, and too hotly. She would leave me if I stayed. I knew this with the certainty of long experience. Not tomorrow, not the next day, but soon enough. A more proper companion would cross her path; a man to give her fat children and an honorable life. She would struggle against it, resist, resent, until the bright flame between us flickered out. Let her think me called back to my home, unwilling to break my vows. Let her hate me a little for what I am than despise me for that which I am not. Steam still curled up from the teapot. I shaped it carefully, blossom by blossom, until I could pluck a spray of flowers from the air. “To remember me by,” I said gently, and gave them to her. I gathered the last of the warmth from my teacup, tucked it into my heart and let the river carry me away. I’m trying out a new prompt this week! 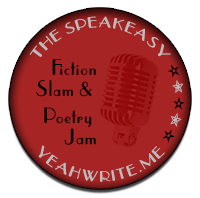 This post was made for The Speakeasy at Yeah Write. And hey, you can vote for me until 10:00 PM Eastern / 7:00 PM Pacific! Visit this week’s Speakeasy prompt page to read all 13 entries and vote for up to three. If one of them is mine, well, I’d be much obliged. This entry was posted in Fiction, Writing and tagged apropos of nothing, speakeasy. Bookmark the permalink. Like almost everything you write, I would follow each drop until my cup overflowed. This was beautifully written. On the surface, leaving seems the noble thing to do, but when I think on it more, I think it’s more of a selfish act. Very eerie – I like the tone of it – a kind of longing for something the person (creature?) can’t have, and it really makes me feel like the person speaking is more wild than civilized. oh my heart. Well you were right, I love this. See so much of what draws me to a story in it. I never did well with people who say, “I am going to leave you before you leave me” although it is the easiest thing to do, it is the only way to protect your heart. The Script said is best , “when I heart breaks , it don’t break even” Someone needs to be left and their hearts are always the ones that I comfort. This is my first introduction to your writing and I like it very much. I can feel their sadness at having to part. This is so vivid! I love it. Christine, this is so lovely! You’ve captured that sadness and regret so perfectly. I love this line especially: “a man to give her fat children and an honorable life” – so much meaning in those few words. Thanks so much for linking up with the Speakeasy this week! Oh, Christine…such beauty. Such beauty. Such beauty. Oh, thank you, Ted! I am really glad you stopped by to read it.